Yager, N., Dunstone, T., 2010. The Biometric Menagerie. IEEE Transactions on Pattern Analysis and Machine Intelligence, 32 (2), pp. 220-230. Yager, N., Amin, A., 2006. Dynamic registration selection for fingerprint verification. Pattern Recognition, 39 (11), pp. 2141-2148. Yager, N., Amin, A., 2006. 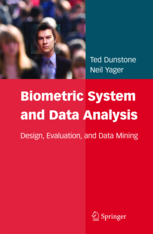 Fingerprint Verification Using Two Stage Optimization, Pattern Recognition Letters, 27, pp. 317-324. Yager, N., Amin, A., 2005. Coarse fingerprint registration using orientation fields. EURASIP Journal of Applied Signal Processing, 13, pp. 2043-2053. Yager, N., Amin, A., 2004. Fingerprint Classification: a review. Pattern Analysis and Applications, 7, pp. 77-93. Yager, N., Amin, A., 2004. Fingerprint verification based on minutiae features: a review. Pattern Analysis and Applications, 7, pp. 94--113. Yager, N., Dunstone, T., 2007. Worms, Chameleons, Phantoms and Doves: New Additions to the Biometric Menagerie. Proceedings of AutoID 2007 [Best paper award], Alghero, Italy, June 2007, pp. 1-6. Seeber, B., Yager, N., Amin, A., 2007. Real-time Detection of Semi-transparent Watermarks in Decompressed Video. Proceedings of the Eighth IEEE Workshop on Applications of Computer Vision (WACV'07), Austin, Texas, February 2007, pp. 49-55. Yager, N., Amin, A., 2005. A Novel Verification Criterion For Distortion-Free Fingerprints. Proceedings of CAIP 2005, Versailles, France, September 2005, pp. 65-72. Yager, N., Amin, A., 2005. Nonparametric Fingerprint Deformation Modelling. Proceedings of CAIP 2005, Versailles, France, September 2005, pp. 73-80. Yager, N., Amin, A., 2004. Evaluation of Fingerprint Orientation Field Registration Algorithms. Proceedings of ICPR 2004, Cambridge, UK, Vol 4, pp. 641-644. Yager, N., Sowmya, A., 2003. Support Vector Machines for Road Extraction from Remotely Sensed Images. Proceedings of CAIP 2003, Groningen, The Netherlands, pp. 285-292.